Our products come in a range of colours and sizes to meet your specific requirements. When using TCM Colour oxide in Grey Cement you can achieve impressive results. 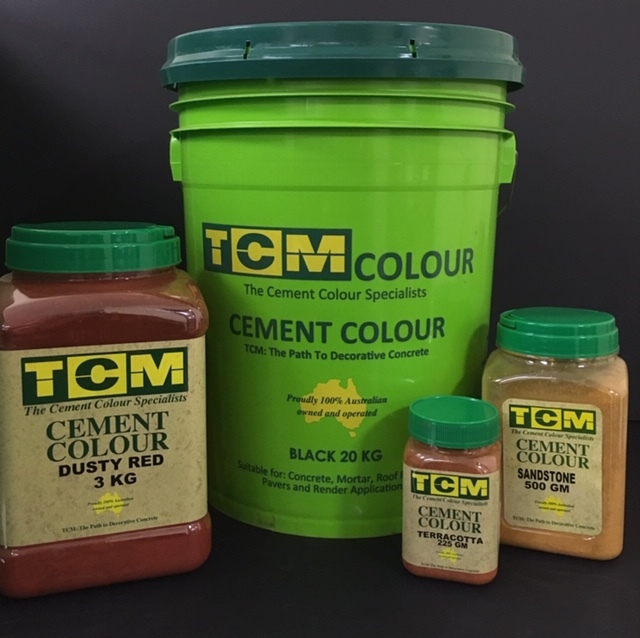 Transform the traditional driveway, carpark, floor slab, tilt panels, kitchen benchtop, or any concrete product into a creative masterpiece using TCM products. These colours are best used integrally and then finished to your requirements, whether it be exposed aggregate, polished or even steel troweled. When using TCM Colour oxide in Off White Cement you can achieve impressive results. Transform the traditional driveway, carpark, floor slab, tilt panels, kitchen benchtop, or any concrete product into a creative masterpiece using TCM products. These colours are best used integrally and then finished to your requirements, whether it be exposed aggregate, polished or even steel troweled. We strongly recommend coating the finished surface with the appropriate TCM Coloured sealer to protect and enhance your investment. Please refer to our sealer section for more information.